Chipped-stone projectile points are used to mark the passage of time and cultures in the record. 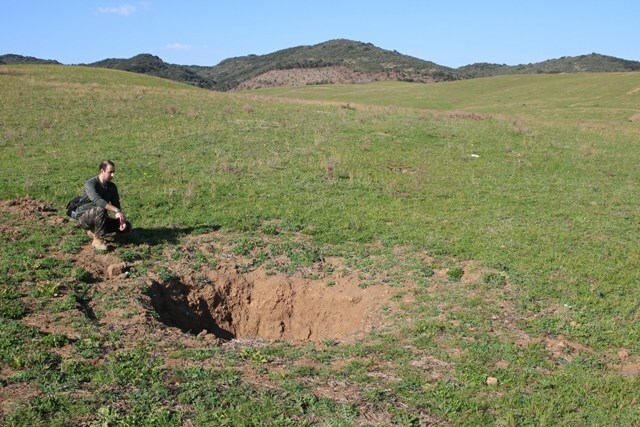 Archaeologists often recover points in surface survey, yet we do not know how many were found by private collectors before or after professional work. In a 1975–1977 Michigan probabilistic survey, professional archaeologists documented 30 private collections from 20 sample units. In those units, points found by private collectors outnumber professionally recovered ones by a factor of about 32. The survey region's point population estimated separately from the professional and private-collection samples differs by nearly an order of magnitude in favor of private collections, despite highly conservative assumptions about the latter. The number of points found in professional survey is inversely correlated with the number found in private collections, and the professional sample is more sparsely and randomly distributed. However, proportions of several common types are similar between professional and private collections. To the extent that large, reasonably complete samples of points are important for research and preservation, archaeologists must document private collections compiled in and near their survey areas. So basically what the work done in the 70s was demonstrating is that surface sites are not only depleted by the activities of collectors, but that the nature of the assemblage is changing through selective pickup by collectors. I wonder what kind of archaeology is being practiced when it is seen as enough to recover context of deposition, patterning and associations through the documenting of scattered and ephemeral personal collections 'compiled' (sic) in and near their survey areas. It is not the artefacts that need documenting, but the documentation of the context of discovery. So collectors destroy evidence, but this artefactologist is saying its OK if we can get to record the nice bits. Is it? Trump administration officials on Wednesday launched a new office called VOICE to assist victims of crimes committed by undocumented immigrants as part of the president's executive order to curtail illegal immigration. As part of the VOICE office, immigration officials also established a hotline where "people impacted by crimes committed by illegal aliens" could receive support. Fortunately some of the good people of the US struck back at these nasty policies. An outside observer of the train-wreck that is US society these days might suggest starting another more useful hotline VOGL Victms of Gun Laws. Vignette: Trump is dragging the good name of good US institutions through the mud. US Dealer publicly admits Laundering by Misdescription.. Since you mention shipping/receiving: It all depends on how much attention you wish to bring down on yourself. When I ship overseas and have to declare the contents, for coins I always use the designation “numismatic token”. I have never had a problem. But if I declared any various keywords, such as Roman, Syrian, Iranian, Italian, etc., it would likely attract attention. As for other items, well, who can say? If I sell a Marlik spear point I might call it a “metallurgic item for study” or something similar. I’m not lying, its true what I say, I am not doctoring anything. By doing so I avoid unwarranted attention either by government officials or thieves. Well of course calling a spade a 'sheet metal implement combined with non-metallic hafting' avoids drawing attenton to the fact that there is a spade in the package, but that is not an honest way to conduct any kind of business. 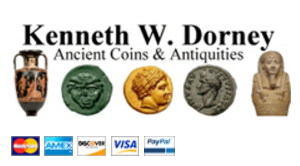 Why would Mr Dorney sending licitly sourced antiquities by perfectly legal means (following all the procedures)wish to avoid drawing attention to the propriety of his activities? I would have thought that a responsible dealer would want quite the opposite - confirmation of the propriety of all he does. Or has Mr Dorney in fact something to hide? "I do not believe that President Trump has the legal authority to rescind a national monument designation, and if he attempts to do so, I will fight him every step of the way. This executive order is nothing more than a political move that will waste limited resources and unnecessarily add uncertainty for growing businesses and communities around these monuments, including two in New Mexico. "Our national monuments are treasured by New Mexicans and Americans, hold enormous significance for Tribes, and help fuel an $887 billion outdoor recreation industry that creates and sustains millions of jobs. If Secretary Zinke decides to review Organ Mountains Desert Peaks and Rio Grande del Norte, he will find strong, vibrant monuments that are driving new recreation and tourism-oriented businesses and jobs and that are the pride of the surrounding communities. These monuments are luring thousands of outdoor enthusiasts to New Mexico and invigorating local economies - from retirees and outdoor enthusiasts visiting Las Cruces for OMDP, to tourists drawn to the breathtaking attractions in Taos and the historic Village of Questa, which is hoping to diversify its economy as a gateway to Rio Grande del Norte. "At Bears Ears National Monument in Utah, Indian Tribes are, for the first time ever, co-managing lands, preserving centuries-old sacred areas that contain troves of antiquities and tell the history of early peoples in the Southwest. Monuments like Grand Staircase, Bears Ears, OMDP and Rio Grande del Norte are huge assets to their communities and the economy in New Mexico, Utah and the Mountain West. "Today's order represents yet another broken promise from President Trump. On the campaign trail, the president pledged to carry on the conservationist legacy of Teddy Roosevelt. But today he is beginning the process of going where no president before him has: using never-tested and dubious legal authority to try to reverse national monument designations. As a member of the Appropriations and Indian Affairs committees, I will fight to protect and elevate these cherished monuments, and I won't stand by if the Trump administration tries to open the door to selling them off to the highest bidder." It is instructive to compare two recent blog texts on the finale (?) of the ACCG Baltimore illegal Coin Import Stunt which they hoped would overthrow US heritage protection legislation. The ACCG not only utterly failed but the verdict seems instrumental in coming one step closer to the situation the dealers and collectors feared. It serves them right for eschewing the opportunity to show that responsible collecting is possible. The first text is by one of the characters involved in the debacle (and since he was a paid lobbyist of certain 'professional numismatist' associations, financially benefited from participation and causing to to drag on for as long as possible): Peter K. Tompa, 'US District Court Ruling Favors Government in Long Running Forfeiture Case' ACCG blog, April 06, 2017. This is maintained in the whiney playing-the-victim tone we have come to expect of this crowd. 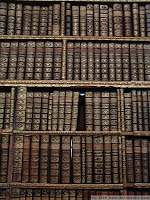 They are all in denial about the existence of any problems with no-questions-asked collecting, so when they are required to actually document that they have checked the legality of the exports of the objects they are buying, it is the Federal government who 'does not understand' (federal laws) and only the dealers have the monopoly on the way the law should be interpreted. I have argued on this blog long and hard with the ACCG views, and found their interpretation lacking - as did the judges in this case for the most part. So Tompa mostly moans about that. He still refuses to understand the point about the Designated List - the judge however does. But the ACCG got seven Chinese coins back because it was impossible to judge that they were of a type listed on the Designated List. So look out for them being sold by an ACCG dealer near you. The Guild’s argument appears to conflate two terms defined in the CPIA: “archaeological . . . material of the State Party” ... and “designated archaeological . . . material” .... “Archaeological material of the State Party” is “any object of archaeological interest . . . which was first discovered within, and is subject to export control by, the State Party.” 19 U.S.C. § 2601(2). “Designated archaeological material” is “any archaeological . . . material of the State Party” which is “covered by an agreement under this chapter” and “listed by regulation under section 2604.” Id. § 2601(7). Only “designated” material is subject to import restrictions under § 2606 [of the CPIA] and potentially “subject to seizure and forfeiture” under § 2609 [of the CPIA]. Id. §§ 2606(a), 2609(a). It was the government's burden to show "that the [detained] property has been 'listed in accordance with section 2604'" of the CPIA. "If so, 'the burden of proof . . . shifts to [the Guild] to establish, by a preponderance of the evidence, that the property is not subject to forfeiture, or to establish an applicable affirmative defense.'" Applying this analysis, Judge Blake assigned title of all the Cypriot coins and some of the Chinese coins to the United States, and gave the Guild seven Chinese coins. Judge Blake explained the law of the case this way. Once the government establishes its burden to prove that detained coins are among the types listed on the CPIA's § 2604 designated list, then the claimant bears the burden to show that the coins are importable. The burden "'shifts to [the claimant] to establish, by a preponderance of the evidence, that the property is not subject to forfeiture, or to establish an applicable affirmative defense.' (Quoting U.S. v. Eighteenth Century Peruvian Oil, 597 F. Supp. 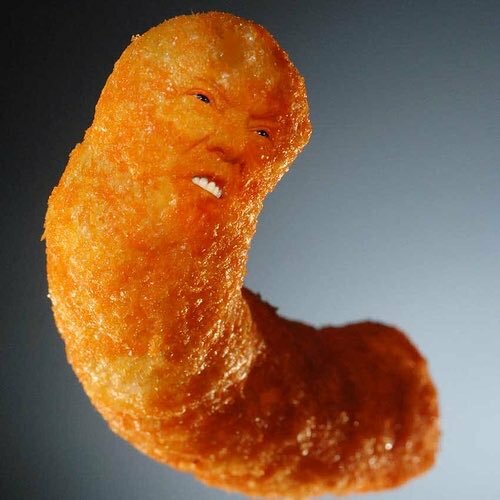 2d 618, 623 (E.D. Va. 2009))," meaning that the ACCG had to produce documentation that the coins were, as the earlier Fourth Circuit opinion declared, "(1) lawfully exported from its respective state while CPIA restrictions were in effect; (2) exported from its respective state more than ten years before it arrived in the United States; or (3) exported from its respective state before CPIA restrictions went into effect." The Guild failed to produce any documentation. Oh ho ho... making buyers/sellers liable to prove they are innocent rather than the government to prove they are guilty is a significant legal step and precisely what antiquities dealers and their clients wished to prevent. Well done ACCG for clarifying this issue. The reasons for rejecting the attempt by the ACCG to introduce 'expert testimony' into the proceedings are worth reading too. We remember that it is the dealers and collectors (ACCG) who are adamant on sticking to 'the letter of the law', but when the court does it, they claim they are being unfairly treated. OK, Ms He, how did this get on the market, then? Poor Helena He, she lost some of her antiquity-dealing profits the other day: Alex Ross, 'Roman jewellery stolen from shop' York Press 25th April 2017. Ancient Roman jewellery worth more than £5,000 was stolen from a York shop by two thieves. 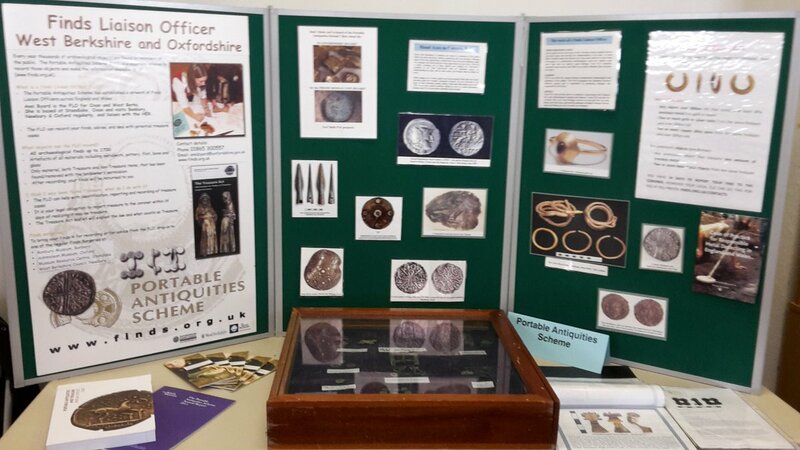 The men removed three pairs of earrings, a Roman necklace, gold ring, silver pendant and gold necklace on Saturday from a cabinet in Brigantia, a shop in The Red House Antique Centre in Duncombe Place. Devastated owner Helena He has run the shop for more than 10 years and says one thief managed to unlock a cabinet and remove valuables while another acted as a look out. One pair of earrings alone cost £595. She said: “It’s very shocking. Yet not once does the news article seem to suggest that selling off loose bits of the archaeological heritage to scattered private buyers is in any way a shocking way to treat the archaeological record. Collection-driven exploitation of the archaeological record shocks nobody in Britain because metal detecting has taken over the national imagination as a way to turn dirt (and everybody's history) into private profit. And British archaeologists and museums are aiding and abetting the process. The aforementioned shop (an Aladdin's cave of various suspicious-looking artefacts with no paperwork mentioned upfront - where did that Middle Eastern Glass come from?) is just a stone's throw from the Yorkshire Museum. Meanwhile those artefacts will pass onto the international no-questions-asked antiquities market with the flood of other surfacing (from underground) artefacts, and will never be seen again. So, a bit like the other artefacts Ms He sells in her shop. Brigantia is cited as part of the collecting history of various noteworthy objects by Timeline Auctions here, here ("Property of a West Yorkshire lady; from the private collection of John Moor, Brigantia Antiquities, York, UK; acquired in the 1960s. Extremely fine condition. Very rare" Treasure Trove legislation was in force in 1960s), here (dodgy attribution), here (dodgy-looking to my eye), here, here ("Ex Brigantia Antiquities, York, UK; formerly from a North Country private collection in the early 1980s, acquired from Astarte Gallery, London, UK. Very fine condition. Accompanied by an Art Loss Register certificate. ")... and so on. There seems an interesting connection here - and in no case is the actual point (or even country) of origin noted. (a) The Secretary of the Interior (Secretary) shall conduct a review of all Presidential designations or expansions of designations under the Antiquities Act made since January 1, 1996, where the designation covers more than 100,000 acres, where the designation after expansion covers more than 100,000 acres, or where the Secretary determines that the designation or expansion was made without adequate public outreach and coordination with relevant stakeholders, to determine whether each designation or expansion conforms to the policy set forth in section 1 of this order. Israeli police and members of the archaeological department of the Civil Administration raided a home in the village of Hawara in the West Bank and arrested the owner, a man in his fifties, and seized a large number of ancient artefacts (Ido Ben Porat, 'Stolen Second Temple period antiquities recovered in Samaria', Israel National News 25/04/17). The [man] is suspected of purveying ancient artifacts, not announcing their discovery as required by law and illegal possession of weapons. The search in the suspects house and store revealed hundreds of coins, pitchers, figurines, earthenware scales, jewels, basalt stones used to grind wheat, copper utensils, water and oil jars as well as a Sten gun and a rifle. 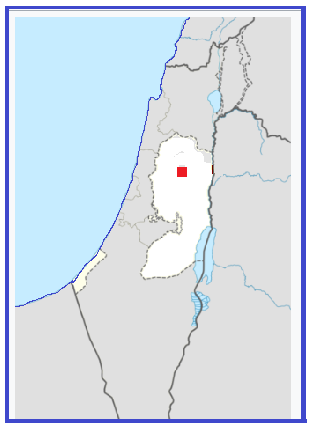 Members of the archaeology department estimated that the artifacts were from the Hasmonean, Bar Kochba, Second Temple, Assyrian and Roman periods [...]. 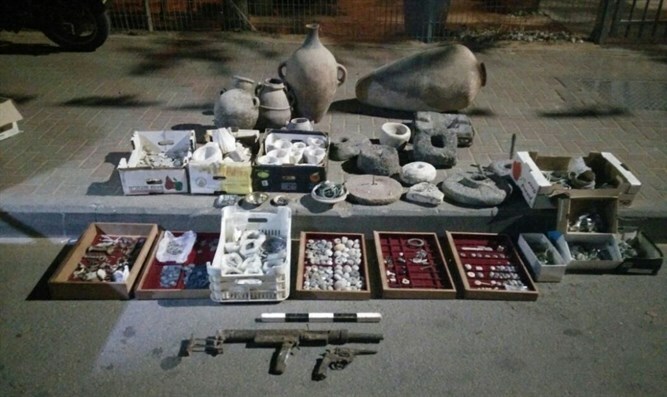 The Arab claimed on investigation that he had bought the artifacts for his own private collection. The investigation is continuing. Note the use of terms like Samaria and Second Temple (and 'Arab') to claim these objects as the heritage of one group and not another. The supply of fresh artefacts onto no-questions-asked foreign markets is due to such people who buy the artefacts locally and then sell them on. Laura Silverman in her 'lifestyle' presentation of Treasure hunting and the Treasure 20 campaign begins with 'a horror story in history (sic) circles about how we almost lost the treasure at Sutton Hoo'. which she then uses as justification for Mike Lewis enthusing how wonderful the Treasure Act is for saving 'many important archaeological objects' which 'were not protected by law', putting 'our heritage at risk'. This is the problem when you look at archaeology as merely about digging up 'treasures'. The Treasure Act only refers to artefacts made of precious metal (gold or silver) or prehistoric metal objects found in hoards. Any artefacts of bronze not in a hoard, or not prehistoric, any wooden objects (like those at Must Farm), wooden tablets with writing on them, pretty cavalry helmets, stone sculptures of gods and devils, fall through the net. This selective law based on the material an item is made3 of rather than its archaeological or cultural significance law is a travesty, a totally inadequate basis for defining cultural property. That's why collectors love it so much. It is worth asking ourselves which of the iconic items in the British Museum, found in Britain, would have been claimed for the nation under such a law. the Rosetta stone no, the Parthenon and Bassae marbles, no. The Folkton drums, Icklingham lead tanks, no. And som on - if the True Cross was dug up in a garden outside Glastonbury ift could quite legally be put on EBay by the finder. No Mr Lewis, the law you are praising is Bonkers-Britain crap and needs changing. Everybody is well aware of it, and nobody lifts a finger to do anything about it. Your dumbdown Treasure 20 campaign ('viewers vote' like some pathetic lowbrow reality show in a karaeoke 'who needs the experts' tekkie lovefest) does absolutely nothing to advance that public debate. It is shameful that someone in your position acts as if he does not see that. In any case, reducing every piece of archaeological evidence (artefact) to the lowest possible common denominator of 'treasures' (and not treasures - like the Sutton Hoo ship nails) in this case obscures an important difference between Basil Brown and the the team of archaeologists who excavated the site and gormless grabby hoikers with metal detectors. That is Mrs Pretty was looking for knowledge, not 'treasure'. That may be difficult for 'lifstyle' journalist to grasp, but it is the job of archaeological outreach organizations to put them right. 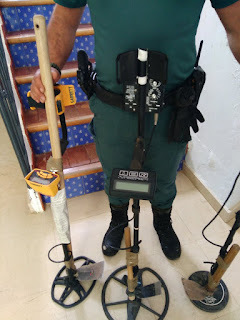 It seems from the resulting article written in collaboration with the British Museum that this task is well beyond the capabilities of the current team making up the Portable Antiquities Scheme. In response to the fatuous Treasure 20 initiative of the British Museum, perhaps a body advocating real-archaeology (the one that's not a grabby treasure hunt) could draw attention to five million portable antiquities which have NOT found their way onto the PAS database since it was set up twenty years ago and many of which are probably now in skips and landfill. FIVE million Portable Antiquities Losses due to current policies which allow artefact hunting and make responsible reporting voluntary. 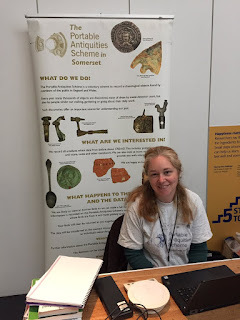 I think equally the same responsible UK real archaeology bodies should be calling on the British Museum to call a halt to the Treasure 20 campaign, which only promotes treasure-hunting and nothing else. Sam Hardy‏ @samarkeolog 5 godz.5 godzin temu5 godzin temuWięcej"The coins were valued at £320,000. Crisp celebrated by buying his wife a box of chocolates and showering her in £200." True love. I can't see any redeeming features in this article or the event. Why would the BM do this? Undermines the PAS totally. PAS started undermining their own mission from day two, I think. To celebrate 20 years of the Treasure Act, the Telegraph is launching Treasure 20 in association with the British Museum. The competition will highlight the 20 best treasure finds discovered over the past 20 years, picked by experts and Telegraph representatives. [...] Readers will then be able to vote online for their favourite. Lewis says there are up to 10,000 regular metal detectorists. Dr Marsden believes “an absolutely enormous amount” of treasure is left in the ground. “Metal detectorists are like rescue archaeologists,” says Dr Marsden. No, Treasure hunters are Treasure hunters, archaeologists are archaeologists, archaeology is not 'just' about digging up old things and if Dr Marsden really does think that is all it is, in my opinion he needs to think about getting another job. The British Museum should be urged by British archaeological and heritage conservation bodies to to drop this ill-considered 'Treasure 20' campaign, which only promotes treasure-hunting and nothing else (it is not even 'encouraging reporting, because reporting Treasure is obligatory). Scandalous. Following the Code by Detecting on Pasture? Buy or borrow a metal detector. The Garrett Ace 150 (£149.95) is popular with beginners. Experienced enthusiasts swear by the XP Deus (from £715). Both from regton.com. Take a small spade for digging, and a bag and piece of cloth for potential finds. Pick a field. There is no magic location. The same field can turn up nothing one day and a hoard the next. 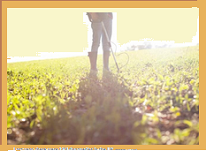 Get written permission from the landowner. You can download a form from the National Council of Metal Detecting website (www.ncmd.co.uk). Follow the Code of Practice for Responsible Metal D-detecting (finds.org.uk/getinvolved/guides/codeofpractice). 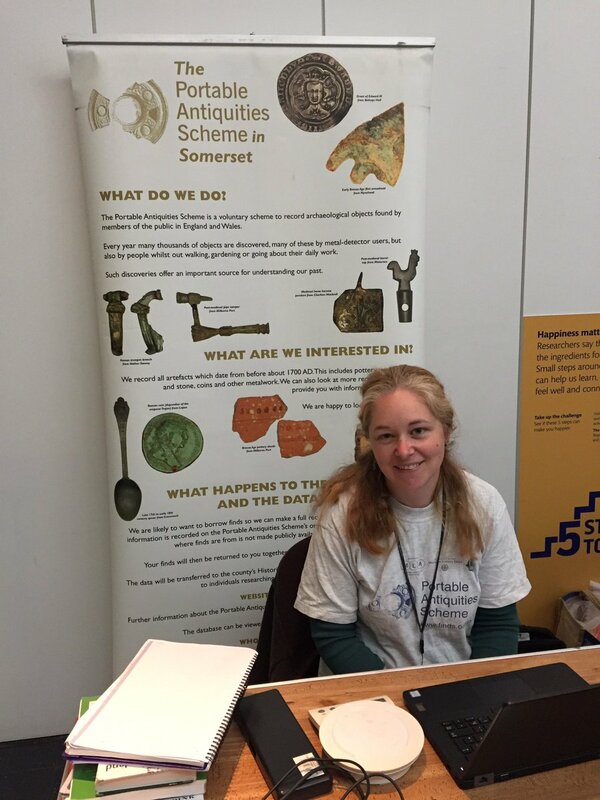 It is important that all finds, not only treasure, are recorded with the Portable Antiquities Scheme. Be methodical. Swing the detector slowly, keeping the level with the ground. Stay alert. I have found a Neolithic axe head, fossils and pottery in the grass just by looking. Be patient. The joy of metal detecting is in the surprise. For your local metal- detecting club, see ukdetectornet.co.uk. You see, that is "all" you need to know to go about dismantling an archaeological assemblage in order to fill your pocket with collectable artefacts. there is (of course) NOTHING more to know about deposit taphononomy, deposition conditions, soil changes, surveying and plotting techniques. ANYBODY can be a 'citizen archaeologist' by simply buying a machine and going out there wiv there spade. Mr Crisp, you have a lot to answer for. British Museum too. In all my years of swinging the coil, I have amassed quite a few odds and ends. They will be worth very little – if anything – to my descendants. 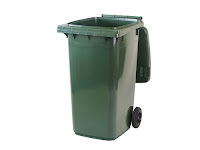 When I eventually shrug off my mortal coil they’ll just see them as a nuisance and hire a skip for disposal. They'd be 'worth' a whole lot more to us all if they were properly documented. Is that not part of the 'best practice' the PAS should be imparting to these folk? Since 'metal detecting' has been going on since the 1970s and demographically it always was a hobby predominantly associated with males already of about retirement age, one wonders just how many of the hundreds of thousands of unrecorded artefacts that they hoiked in their day have already ended up in skips and landfills, wasting all the information destroyed in their selfish removal? All over the classical world, sites like Caere (Modern day Cerveteri) are looted repeatedly to supply dealers with portable antiquities to profit from by selling them to collectors. 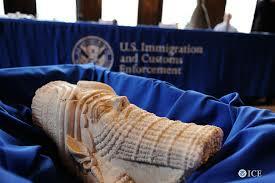 In the no-questions-asked trade in artefacts there is no distinction between dodgy dealers and the others. They are all mixed up in the 'dirty art' trade. Those that oppose heritage protection measures should be ashamed of themselves. (photo Redazione, 'Tombaroli ancora in azione a Cerveteri' OrticaWeb, 6 April 2017). 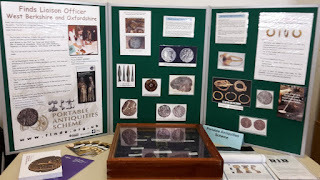 Are the public being adequately informed about what 'archaeological evidence' is, or are they being shown mere Treasure Hunting? Archaeology, what is it, FLOs? Do any of your public displays include a proper definition of the term? Today on March for Science Day the words of Carl Sagan on public attitudes to knowledge seem apposite to the progress of dumbdown, karaoke science and expert-dismissal we see al aound us, but also reflected in archaeology through the appearance of the PAS and its own particular promulgation of what constitutes 'citizen archaeology'. This should be challenged and resisted, but Britain's jobsworth archies have yet to find a stomach for it. Heritage Action once again put facts into context - an activity the many (hundreds of?) supporters of private collecting of archaeological artefactsin Britain are all to obviously incapable of: 'PAS performs another round of the Darwinian quango survival dance!' 22/04/2017 ). They juxtapose the way the public are ionformed about two similar hoards of gold sovereigns: the 'piano hoard' and the 'Twinstead hoard' ( “Metal detector enthusiasts on a charity day ended up in a brawl after 300 sovereigns worth £75,000 were found in a field. They then ran off with the loot”). Strange, isn’t it? In Bonkers Britain PAS garners oodles of news coverage from one hoard yet they (and the police) downplay mass theft of an extremely similar one. Such is the consequence of setting up a quango whose sole survival chances depend on pretending that buying a £10 ticket to a detecting rally transforms totally random people into “citizen archaeologists” with immaculate morals. It is not so much strange - the PAS has always done precisely this sort of thing where their 'partners' are concerned - it is however a very serious scandal that the public are not being properly informed about portable antiquity issues by the 'scheme' set up to do precisely that and for twenty years have consistently been utterly failing to do so. The schemers are busily colluding to avoid informing their public properly and objectively about the downside of private collecting of historical artefacts. 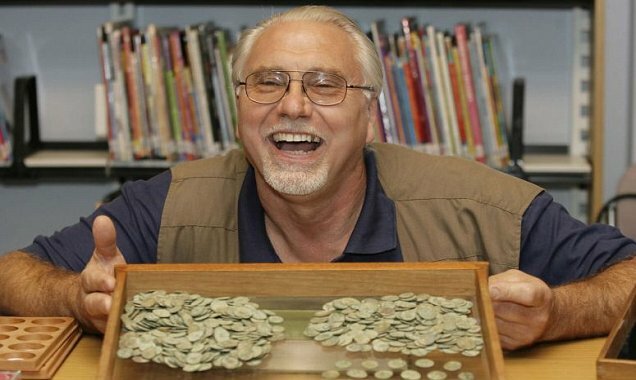 One hundred and ninety ancient Roman coins that were illegally imported into the United States from the United Arab Emirates were seized by officials from U.S. Immigration and Customs Enforcement’s (ICE) Homeland Security Investigations (HSI) and U.S. Customs and Border Protection (CBP). The ancient coins were originally detained in March 2014 during a routine inspection at the Port of Cincinnati cargo facility by CBP officers before the investigation was turned over to HSI. The intended recipient told investigators the coins were of Middle Eastern origin based on information received from an overseas seller. CBP officers contacted a coin expert to authenticate the coin’s origins and learned they were late 2nd or 3rd century Roman coins. Authorities subsequently issued a seizure notice to the intended recipient alleging entry of goods by means of false statements. The intended recipient abandoned the claim to the coins, which will now be repatriated to the appropriate country of origin at a later date. The coins have an estimated value of approximately $1,000. Well, of course determining a 'country of origin' for goods where the paper trails have been deliberately obscured by the sellers is pretty well impossible (barring US waterboarding of a dealer or two, which I would not support). The legible mintmarks on the coins point to some being minted in Antioch (in Roman Syria), but as dealers insistently point out, 'coins circulated widely' and these artefacts could have been dug up on almost any site in the eastern parts of the ancient ('classical') world and items from different sites (note the variation in corrosion products) from different sites amalgamated in a job lot of artefacts orphaned from their paperwork and any context. It is the evil no-questions-asked antiquities trade and dodgy dealers involved in it that have destroyed the context and destroyed the evidence of origins. It seems disingenuous of spokesmen for the same industry now to be creating a fuss about the measures adopted to respond. Could the coins have been exported to the US by an unnamed seller based, perhaps, in Dubai? How many dealers in dugup antiquities gathered from several regions of the ancient world are there in the UAE, and Dubai in particular? It seems that 'Nafertiti Eastern Sculptures Trading in Dubai' has gone out of business (or underground) since the fuss around Salem Alshdaifat. Who else is active in Dubai and are they ACCG members? The point is of course that dealer "Dubai Dakhil" (let's call him) exporting antiquities as coming from the UAE as the country of origin when they did not in fact come from there is trying to 'launder' the artefacts that in all likelihood came from one or more other country (for example Syria) - for the export of which he is unable to supply the proper documentation. 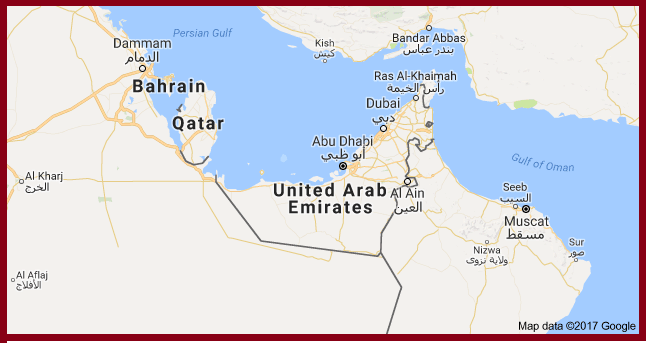 If he cannot show that the coins arrived in UAE legally, then he cannot show that he has title to them and therefore cannot show that he is exporting them himself legally. In that case then having been stopped for examination at the US border, they cannot then be allowed to pass onto the US market. What then to do with them? 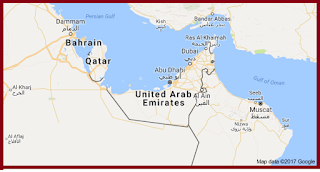 They cannot be sent back to the dealer who claims 'ownership' but cannot show legal title, they cannot be sent back to the country of origin as that dealer destroyed all evidence of where they came from and how they arrived in the UAE. They cannot stay in the US. Perhaps they should just be destroyed as decontextualised bits of old metal which have no known owner? Perhaps they should be sent to another country to sort out what to do with them after the antiquities trade rendered them orphans? This, in fact is what the US authorities in this case decided to do. Sad news. Internationally-acclaimed Polish sculptor Magdalena Abakanowicz has died at the age of 86. There are some deeply disturbing photographs on the Facebook page of Kapoor Galleries, New York City. They show people holding a drink or two in front of some bronze idols of Hindu gods and goddesses which should be in the sanctum sanctorum of temples in south India. 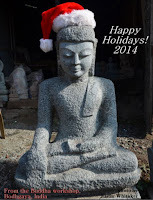 Then there is this Buddha statue made to wear a Santa Claus cap. Not funny. In fact, it is quite painful for any devout or just anyone who loves and respects antiques. For the uninitiated, Kapoor Galleries belong to Ramesh Kapoor, the brother of Subhash Kapoor, who is cooling his heels in Puzhal Central Prison. ([ Anon TNN], 'For God’s sake, save our idols from New York parties' Times of India: Apr 20, 2017). The author not only argues that American dealers and collectors are treating sacred images with no respect at all, but for shifting the onus of proving the veracity to the seller and not the source country. In a press article (Gintautas Dumcius Boston Public Library takes part in returning nearly 200 ancient Roman coins and other artifacts to government of Italy April 19, 2017) we learn that after the 'intended recipient abandoned the claim to the coins' and determining that the sender was not going to tell where they actually came from (let alone be able to provide documentation), US homeland security officials and Boston Mayor Marty Walsh handed over to the government of Italy for safekeeping in a Wednesday afternoon ceremony. The objects are those that were discussed here earlier: 'HSI Press Release Stupidity in Ohio', PACHI Friday, 31 July 2015. Looking at these coins and guessing the mintmarks from the fuzzy photo supplied, I wonder just what the likihood is that some of them were ever in Italy before. Still, since they have officially been denied entry across US borders, they cannot stay in the UK (still less go to their hapless buyer who did not assure himself before purchase of the dealer's ability to document licit provenance), nor can they be assigned to their country of origin, so passing the problem of what to do with them to Italy is as good a solution as any other. These are the consequences of buying artefacts which a dealer has divorced from any paper trail of how they arrived on his stockroom. 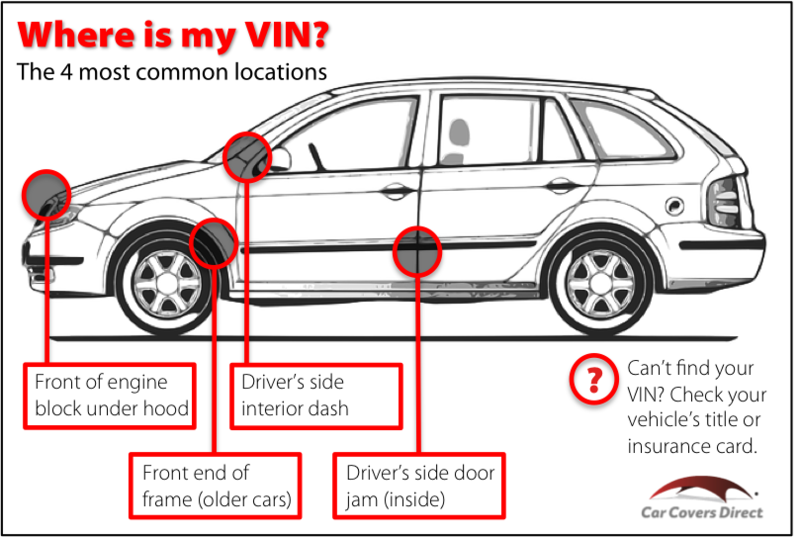 It's like buying a car where the chassis number has been filed off. Buyer, beware such dealers, they are nothing but trouble. I have discussed the case of Jonathan Bourne on this blog before ('Amateur Collector loses Artefacts'. PACHI Saturday, 12 September 2015; 'California doctor pleads guilty to looting Native American artifacts from public lands' PACHI Saturday, 20 August 2016). * There is a longish piece in the 'Adventure' section of something called Men's Journal discussing the case (Kathleen Sharp, 'How a California Anesthesiologist Became One of America’s Largest Antiquities Looters' Men's Journal n.d.). Bourne was a wealthy Mammoth Lakes anesthesiologist who had filled his large house with Native American items he'd collected over the years. In 2014 he was investigated for artefact on federal land and his house was searched. Within months, the respected anesthesiologist would find himself facing 21 felony counts and at the center of a criminal investigation that became one of the largest stolen-goods cases in the history of the Bureau of Land Management (BLM). But to hear Bourne tell it, he's just a passionate collector who took a few items to ensure they weren't lost to time. [...] His defense was simply that he had not done this for himself but to preserve the objects. "He has never sought financial gain from his collection," Penny says. Rather, he had long flirted with the idea of donating his collection to a museum — although few, if any, museums accept artifacts of unknown or illegal provenance. "I did hope to donate my collection ultimately," Bourne says. when investigators showed up at Bourne's home, they were stunned at what they found: some 30,000 relics displayed artfully in room after room. Half of them, Bourne admitted, had been taken from federal lands or Native reservations. Others had been purchased at antique stores or from other collectors. "It was top-notch stuff," says one expert. [...] The agents soon realized that they had stumbled onto one of the country's largest caches of stolen antiquities.[...] 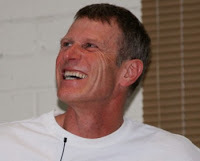 Bourne had stolen pieces from thousands of sites in four Western states: California, Nevada, Utah, and Arizona. The collector kept journals detailing his exploitative trips, many of them to national parks, they not only involved several family members and friends, 'there were other doctors, nurses, several business owners, and a prominent developer. Even a former police officer and a high school teacher had apparently been with Bourne when he broke the law'. After a yearlong investigation, a federal grand jury indicted Bourne on 21 felony counts, including looting, possessing, and transporting stolen government property and artifacts from national parks, national forests, the BLM, and several tribal lands. He faced a maximum of 98 years in prison and a $2 million fine. [...] Bourne also stood to lose his medical license. And because his journals named his two grown children, now physicians, they could possibly lose theirs, too. [...] In August 2016, after months of negotiating, Bourne struck a deal with the federal attorney overseeing the case: He pleaded guilty to two of the 21 counts and faced a maximum of two years in prison. [...] In the end, however, Bourne received only two years of probation and was ordered to pay $249,372 in restitution and a $40,000 fine. [His medical license is up for review this month.] When the court adjourned, he wrote a check for the full amount. To preservationists and Native American leaders, Bourne's court-approved plea deal was a slap in the face. [...] It will take years for the pieces, now at California State University in Sacramento, to be repatriated properly. Bourne was not happy with the judgment, either. "It's not a good deal," he told me. "I escaped prison, but I still think that the scope of the problem and the things I had done are not commensurate with the punishment. I have to pay a lot of money!" He need not worry, the full cost of matching the artefacts to the sites they came from will cost more than the nine dollars he paid for each of them, and the tax-payer of California will be paying the rest of the sum required to attempt to in some small part rectify the effects of his misdeeds. Regular readers of this blog will know that I am extremely concerned about the alleged 'provenence' of the so-called 'Cleveland Apollo' which I feel more appropriately should be named the 'Leutwitz Apollo' after the place where it is supposed to have been found in the rubble of an East German farmhouse (yeah, yeah, pull the other one). So, I am wondering whether the lessons the museum learnt from the 'Drusus Debacle' will be applied to the reported collecting history of that controversial object. The Sessa Aurunca Drusus (as we now know it to be) was excavated in 1925/6 near Naples. But when Phoenix Ancient Art sold it to the museum, it came with a collecting history from 'an Algerian collection as far back as the late 19th century'. So, between the late nineteenth century and the 1920s, this object is claimed (by the Aboutaams) to be documented as having been in two places at once, an Algerian collection as well as buried deep in Italian soil. That's rather like another object the Aboutaam brothers handled and much discussed in this blog, the St Louis Ka Nefer Nefer mummy mask, documented as being in Cairo Museum at the same time as documents (supplied by the brothers Aboutaam) claim it was on sale in Belgium and then in a collection in Croatia. In both cases these are now 'dead-man's documents', their authors having passed on beyond further questioning years ago. How "thoroughly" have Michael Bennett, Katherine Reid and the entire board of trustees of the Cleveland Museum of Art done their due diligence if they (a) have not spotted the discrepancy here and (b) totally fail even to mention it, let alone explain it away in their "exhaustive" publication which is intended to "settle" the matter of where that statue was before they bought it? If nothing else this is intellectual dishonesty not to even quote or mention this information, and typifies a totally superficial approach to the task in hand. And maybe it is time for Cleveland Museum of Art to take a proper (and source-critical) look at the documentation for the Leutwitz Apollo and when they have worked out what seems bleeding obvious (that a physical object, at least in the universe we inhabit) cannot be in two places at once, they can at last take effective steps to determine where the object really came from, and somehow it seems to me that a 'pile of rubble in an outbuilding in Leutwitz' is not going to be the answer. There remains the question of those misquoted lead isotope result to be addressed too. Vignette: Can you believe this nonsense? the museum believed it had clear title, and that the work had been in an Algerian collection as far back as the late 19th century. The museum and its Italian counterparts now believe that Italian archaeologists excavated the Drusus head in 1925 or 1926 in Sessa Aurunca, in the Caserta Province of Campania, Italy, about an hour's drive north of Naples. The archaeologists had the Drusus photographed at the time, along with other discoveries including a marble portrait head of the Roman Emperor Tiberius, father of Drusus Minor. The marble heads were all placed in the archaeological museum at Sessa Aurunca, where they remained until they were removed in 1944. It seems that the Drusus and Tiberius heads were stolen and sold off by French occupation troops in 1944 while they were billeted at the museum in Sessa Aurunca, or the works might have fallen into the hands of North African troops active in the area at the time, perhaps explaining the later appearance of the Drusus in Algeria as claimed in the collecting history supplied to the museum at the time of the sale. 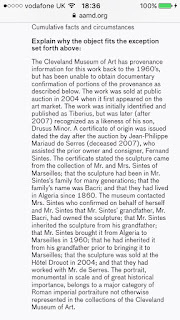 The museum believed at the time that the portrait had been the property of the Bacri family (later known as the Sintes family) of Algiers, Algeria, as far back as the late 19th century. The museum said in 2012 that Fernand Sintes and his wife, then of Marseilles, France, inherited the work while living in Algiers. They subsequently moved it with them to Marseilles in 1960. Fernand Sintes subsequently sold the Drusus at an auction at the Hotel Drouot in Paris in 2004 to an unnamed buyer. 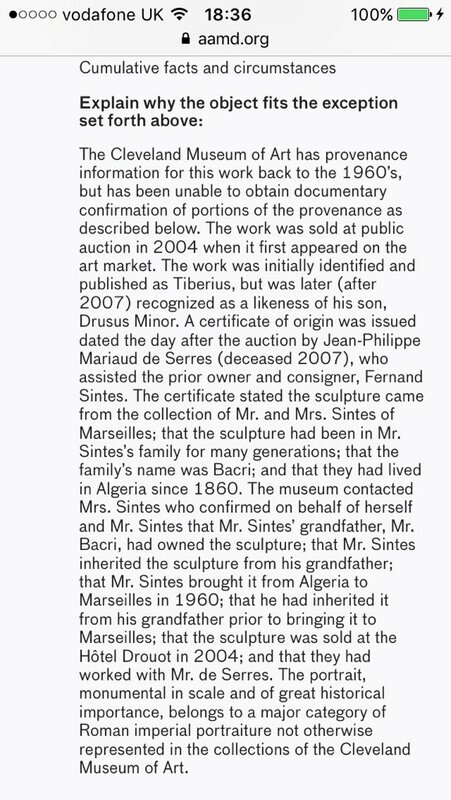 A day later, Parisian art dealer Jean-Philippe Mariaud de Serres, who advised Sintes on the auction, provided a "certificate of origin" for the work that included the Bacri-Sintes history. That document and independent research carried out by the museum later buttressed its faith in its 2012 purchase. [...] because Algeria was a French possession in 1960, no export documentation was required for the Drusus. As a result, no record of the transfer from Algeria to France exists. [....] The museum also didn't know who owned the work between 2004 and 2012. In light of some concerns that were being raised about the object, the Cleveland museum posted a description of the Drusus on the "Object Registry" of the Association of Art Museum Directors, a global online clearinghouse for objects whose provenance is not entirely known (this page has now mysteriously disappeared). Articles published in Italian archaeological magazines in 2011 and 2013 by scholars Giuseppe Scarpati and Sergio Cascella, respectively, reproduced the previously unpublished 1926 photographs taken when the Drusus and Tiberius heads were first unearthed. Those articles suggested that both pieces had been stolen from the local museum in 1944. A third article by Scarpati in 2014, in the Bolletino D'Arte, or Art Bulletin, mentioned the Cleveland museum's purchase of the work, and urged that it be returned to Italy. [....] The museum's purchase of the Drusus portrait in 2012 earned instant criticism from experts including archaeology Professor David Gill at the University of Suffolk in Ipswich, England. He and others complained of gaps in the provenance, or ownership history, of the object. Note that one of the articles was already published before the 2012 sale. Why did the Museum not spot it? It was only last year that the Cleveland museum contacted Italy's Ministry of Fine Arts in late 2016 and proposed collaborating on further research on the Drusus sculpture that also involved the Carabinieri. 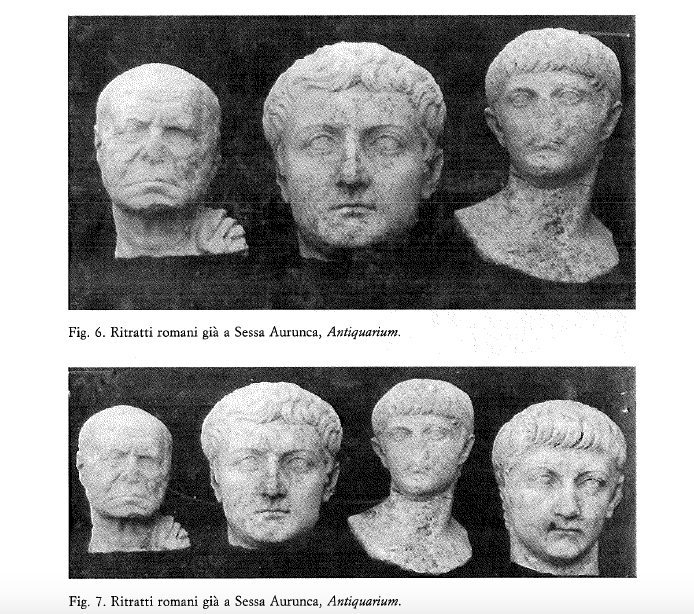 It was established that the Drusus head was the same as the one shown in the 1926 photograph, which means it had been removed from the museum at Sessa Aurunca. William Griswold, the museum's director said that the museum isn't pointing fingers at Fernand Sintes or at Phoenix Ancient Art. "There's a gap [in the Drusus provenance] from 1944 until the 1960s, when the object was in France," Griswold said. "We have every reason to believe it was in Algeria through the '50s, but that's not fully documented." Griswold declined to comment on whether the museum would be reimbursed by Phoenix. 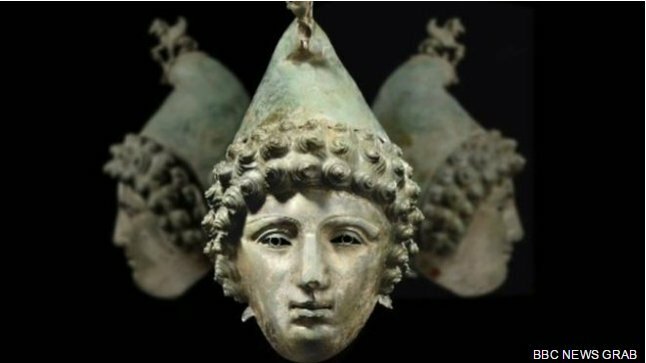 It should be noted that the same Italian author (Scarpatti) has spotted what looks very much like the missing Tiberius head at another gallery, and also sold in 2004 with a '1960s Algerian collection' provenance backstory'. This bust has been discussed by me on this blog three times previously. In my first post (busy with other things as I recall), I took the published collecting history at face value [Monday, 13 August 2012, 'Cleveland Museum of Art buys Roman Bust', but on reading what colleagues were writing decided to take a closer look: Monday, 13 August 2012 'Cleveland Bust: "That World" Already asking Questions, Museum on the Defensive'. David Gill was looking into this object as was the cultural property lawyer Rick St Hilaire ("Unable to Obtain Documentary Confirmation" - Due Diligence and Questions Posed by the Collecting History of The Cleveland Museum of Art's Drusus Minor Head CHL Wednesday, August 15, 2012). My third text referred to this and discussed that collecting history: Thursday, 16 August 2012, '"That World" Getting Closer, That "Due Diligence" Looking Still More Skimpy'. The so-called Crosby Garrett helmet is being placed on public display in Cumbria for a special exhibition starting in April. 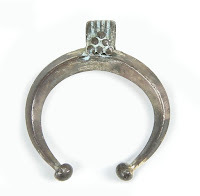 Its anonymous finders say it was discovered near Kirkby Stephen in 2010 but excavations on the reported findspot produced results which inexplicably conflicted with its typological dating and raise questions about its context of deposition which most British archaeologists are playing down. Seven years on, we are therefore not an inch closer to understanding the archaeological context of this object and merely contenting ourselves to rejoicing when a private collector deigns to allow another public exhibition of this highly-restored trophy artefact. Yes the experts do occasionally get it wrong. I have seen objects on the PAS database incorrectly attributed. The worse examples are people selling objects on EBay and you have to be really sure what you are buying! Here we should note that it is more frequently artefact hunters and collectors who are going to be selling artefacts on Ebay than archaeologists. I would recommend not buying any ancient artefact on eBay (or anywhere else) which have no supporting paperwork verifying its squeaky clean licit origins - whether or not you 'know' what it is.... 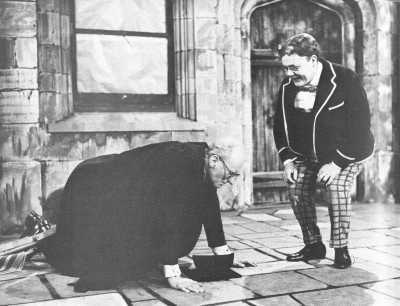 If there was any true collaboration, Mr Mower would have written about the number of times he has notified PAS staff of their errors. Vignette: The little man and jolly japes at the expense of the establishment. Like a bad smell given time it will disappear. Sometimes it’s best to ignore him John and not provide ammunition for him to use. You are not going to change his attitude and like a martyr he will continue to fight his corner! This is pretty typical, artefact hunters and collectors imagine that if they 'ignore' a problem, then it will disappear 'like a bad smell'. But the issue is that the PAS was not set up to enable the artefact hunters of Britain to ignore the problem in their midst and carry on regardless. It was set up to effect a change in attitudes, which I think it is very clear from comments like this that after twenty years of trying (at huge public expense) is just not going to happen. The self-centred likes of Mr Mower simply ignore the arguments that there is a need for change (and who, actually, in this exchange is attempting to 'play the martyr'?). Simpletons who merely take critique personally are not seeing the wider context. The 'ammunition' (as Mower calls it) used by their critics comes from what artefact hunters and collectors themselves write and say about what they do, This is shows very clearly how those engaged in the private exploitation of the archaeological record for collectables see the activity, its effects, and its relationship with wider concerns. That is what I intend to demonstrate in this blog - because none of these things are in face like the manner in which they are portrayed by the British archaeological supporters of artefact hunting and private collecting of portable antiquities. Mr Mower and the rest of you head- in-the-sand artefact hunters, what would change my attitude to your selfish, exploitive and destructive hobby would be clear evidence that attitudes had actually changed deep within the hobby, rather than the declarative facadism that is what we see at the moment. Until we see that, I will continue to fight in the preservationist corner for wider public recognition that the way artefact collecting is done today must change. I hope the PAS will one day get the guts to show that it is, indeed, on the same side, At the moment though both gumption and guts seem to be missing there, empowering people like Mr Mower to come out with such airheaded, divisive anti-preservationist defiance. The 16-page report, “Attack on the Omar Ibn al-Khatab Mosque: US Authorities’ Failure to Take Adequate Precautions,” found that statements by US military authorities after the attack indicate that they failed to understand that the targeted building was a mosque, that prayer was about to begin, and that a religious lecture was taking place at the time of the attack. A proper analysis of the target and its use would probably have established at least some of these elements. Human Rights Watch has not found evidence to support the allegation that members of al-Qaeda or any other armed group were meeting in the mosque. (source of quote: Syria: US Mosque Attack Likely Unlawful; see also, Attack on the Omar Ibn al-Khatab Mosque). Once again, it is the US employment of their traditional hands-off remotely controlled airborne assassinations based on remotely-gathered indirect information that is the root cause of this problem, if the act of aggression had involved regular troops in contact with the community, this sort of mistake would not happen so frequently. Where is the US declaration of war on the state of Syria? What legal conditions sanction such an air strike by one foreign power on the territory of a sovereign state? 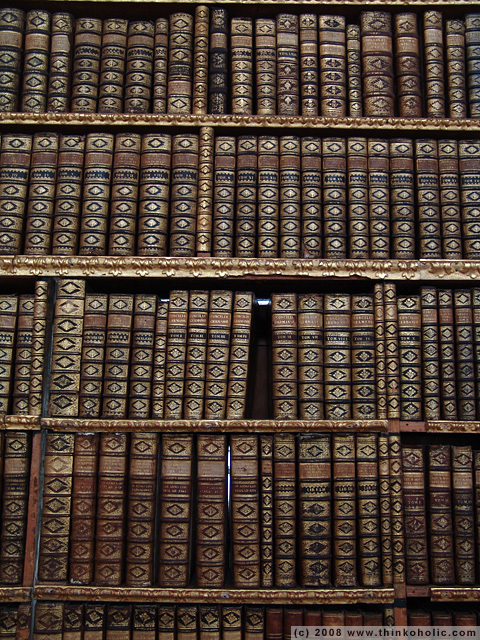 In the text of a review by Sarah Keating, of the book 'The mystery of the library book that went missing for a century'* involving an early printed work removed from Dublin's Marsh’s Library there is a brief discussion of book theft in the eighteenth and nineteenth centuries. The existence of the market promoted the creation of a supply. This is an analogy to the collection-driven exploitation of archaeological sites. Collectors deny the existence of the market has any influence whatsoever on giving cruddy old bits dug out of an ancient site any commercial value. They are simply lying of course, because a twelve year old can see that such a statement is wrong. We have all heard collectors suggesting that the main reason for the existence of collection-driven exploitation (CDE) of the archaeological record which produces the portable antiquities that surface on the market is the number of poor people who are forced to dig over ancient sites for scrap metal to survive. They say the only way to STOP CDE is (for archaeologists - sic) to 'solve the world poverty problem'. 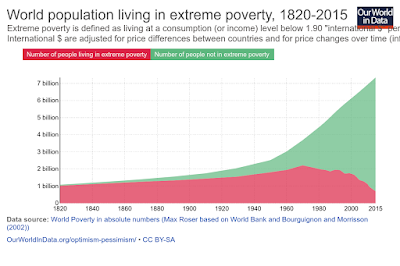 Here is a chart of the proportions of the global population still living in extreme poverty, as opposed to that of those that are not. We see that the number of people in extreme poverty fell by 137,000 since yesterday, as it has done for every day in the last 25 years. There is still a long way to go, but this argument seems less valid today than it might have seemed when first formulated by self-justificatory collectors in the 1960s and unreflexively chanted as a protective mantra for the following decades. I'd draw attention to another consequence of these statistics. The omnipresent claim by collectors that all the unpapered artefacts apparently freshly-surfaced on the market 'could have come from' old collections ('people have been collecting ancient artefacts since....') is nonsense. the green area includes people with disposable incomes - potential collectors. It is very easy to see that in the decades preceding 1970, the number of people living above the poverty line was much, much smaller than today. It is quite simply a physical impossibility for there to have been enough antiquity collectors in the (pre-intrnet trading) world to have pre-owned the number of antiquities currently surfacing on the market. This is simply a highly-implausible lie. 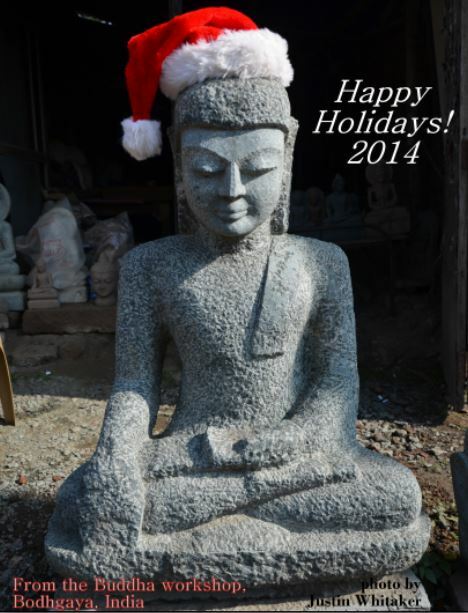 I challenge any dealer in portable antiquities to produce verifiable figures showing I am wrong.